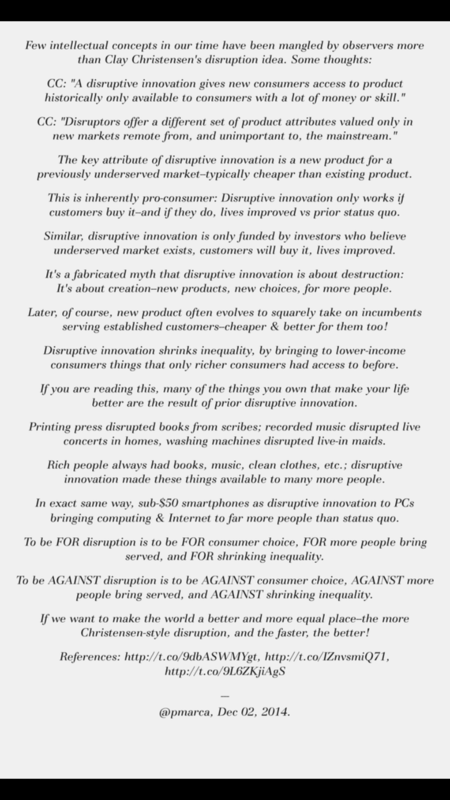 “To be anti-disruptive innovation is to be pro inequality!” Whoa, that’s a fairly strong accusation. How did we get here? 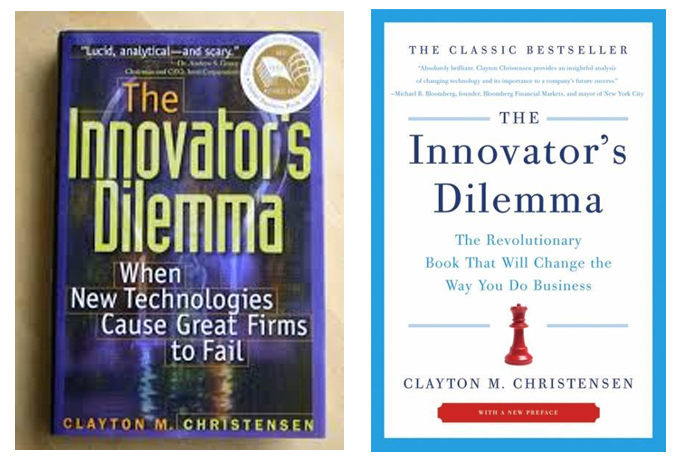 Hasn’t the Innovator’s Dilemma, Clay Christensen’s landmark book describing the process of disruptive innovation, been thoroughly embraced by now. Well, not quite. There are still a fair number of critics of the theory out there, recently galvanized by this strange takedown article published in the New Yorker a few months ago. The article posits that Dr. Christensen’s theory does not stand up to the test of time: many of the incumbent firms that got disrupted in his examples are in fact still around and in business. Furthermore, Christensen has made a few recent predictions that have gone very wrong- most notably, that the iPhone would fail. What good, then, is a theory about why products and firms fail that gets many of them wrong? It’s easy to dismiss those critics of disruptive innovation as naïve, shortsighted, or just dumb. But they’re not. They’re somewhat correct to criticize disruptive innovation as a predictor of how firms fail, at least some of the time. And after all, that’s the question Christensen originally set out to answer: why do large firms, with every incumbent advantage in the world, nonetheless get toppled by upstart competition? But they’re wrong about the stronger, more powerful principle that has emerged out of Christensen’s original thesis. Disruptive innovation, the way we use it today, is not really about why firms fail anymore: it is about how new markets get created. Part of what makes disruptive innovation such an interesting principle (and presumably, what gets people so riled up about it) is that it’s a theory that on the surface appears to say “inferior, substandard products ultimately outcompete premium ones in the marketplace”. This doesn’t sit well with some, especially when looking at current examples of disruptive innovation happening today. Let’s look at my favorite example: Buzzfeed. 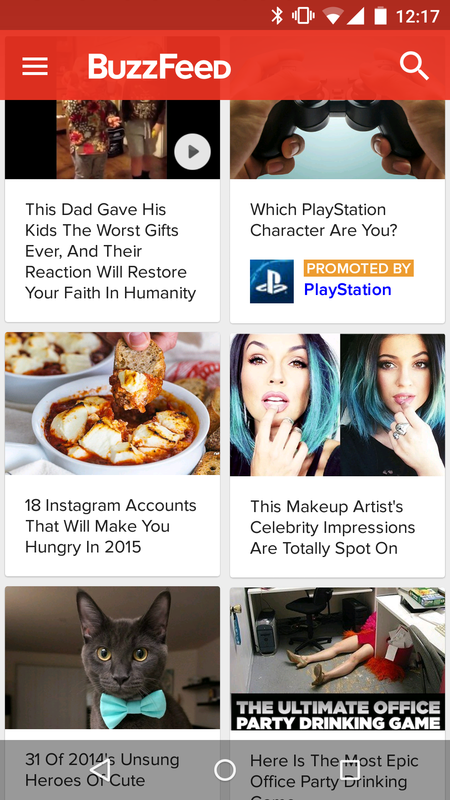 Buzzfeed is an awesome example of a disruptive company in the digital age. Widely mocked by highbrow readers of serious news, Buzzfeed is an absolute rocket ship of growth that’s been fascinating to watch. Starting out as an aggregator of others’ content, then perfecting the art of viral content distribution and discovery, and finally moving upmarket into homegrown news and mature media, Buzzfed’s embrace of the “all content should be able to go viral” thesis (which has been parodied amazingly by Clickhole, one of my new favorite places to waste time) has led to some amazing new innovation in how content gets discovered, shared, and amplified. Unlike the stale, century-old newspaper distribution model, Buzzfeed has been mobile-native from the very beginning, asking fundamental questions that are worth revisiting after a hundred years of centralized, bundled news distribution: Why do people share things? How are those things passed around? How do anecdotes, moments, and stories spread organically from one medium to another? How do humans communicate to one another? Buzzfeed’s mastery of social / viral / mobile-driven media hasn’t only led to their own growth (although their most recent valuation certainly suggests there’ll be a lot more of that coming): it’s contributed to a whole wave of innovation to how content is passed around on mobile: across platforms, between apps, and within overlapping social graphs. 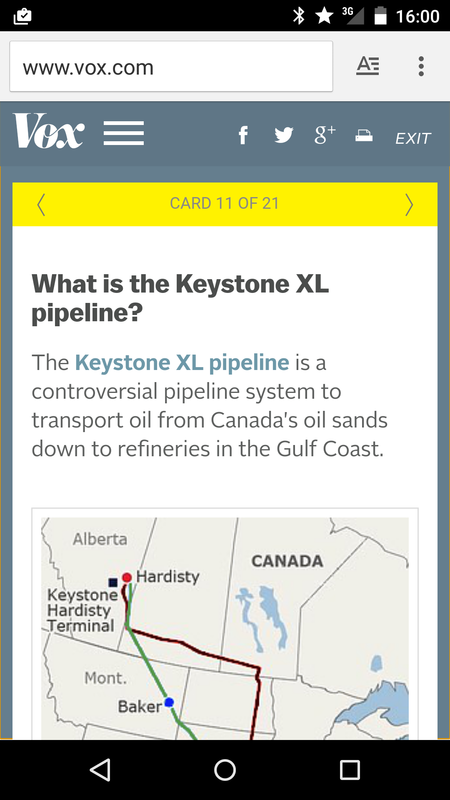 Take, for example, the recent development of ‘cards’: functional, sharable bite-sized bits of content that can be discovered, read and shared across whatever platform you like in a single, cohesive format: the way humans naturally share conversation topics that they’re interested in. 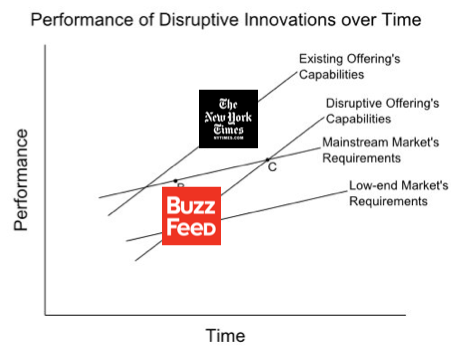 Here’s why tempers flare when you talk about Buzzfeed as a leader in 21st century disruptive innovation: the original form of the principle outlined in the innovator’s dilemma is written as a explanatory mechanism for why older, serious incumbents like the New York Times will fail. That gets a lot of people really upset: how dare you suggest that this cesspool of clickbait-y quizzes and listicles could replace real journalism? Highbrow readers tend to react to Buzzfeed and its new-media cousins with a humorous mixture of derision and panic that blends a) This is a total joke, and people will soon realize how stupid this is and stop wasting their time here, and b) The massive popularity of viral clickbait means that we’re all getting dumber by the minute, and civilization is doomed. The increasing popularity and month-over-month growth of viral news aggregators only reinforces these notions, as irrefutable proof that our societal standards for journalism are reaching new lows every day. On the other hand, the theory of disruptive innovation is quite clear on its implication: that as Buzzfeed and its cousins move upmarket (which they’ve already begun to do), the old bastions of mature print journalism will get squeezed further and further upmarket, focusing increasingly on ‘elite’ content like opinion pieces, until there’s nothing left at the top- they’ll have been disrupted out of existence. So who’s right? Here’s my take: who cares? If you don’t like Buzzfeed, don’t read it. 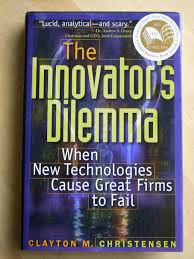 Anyone who insists on seeing Buzzfeed as a dangerous, disruptive threat to their premium content is taking the original subtitle of the Innovator’s Dilemma too literally (“When technology causes great firms to fail”). Disruptive innovation brings change through market creation, not through lowered standards. It’s no longer a theory on why incumbents fail: what’s emerged is more powerful, and more interesting. It’s a framework to explain how expensive and complicated technologies and services are made simpler, cheaper, and more accessible. As Christensen put it, “Disruptive innovation gives new consumers access to a product historically only available to consumers without a lot of money or skill.” If you’re among those who already had access to whatever you’re it is you’re fussing about, then the disruptive product isn’t intended for you anyway. It’s not about you- get over it. The ‘it’s not about you’ response could actually be a good way to find new disruptive products and predict which ones might succeed. The recipe might go: 1) Find some product or service where a relatively small number of people part with significant resources on a regular basis for it to be done; 2) Establish what job-to-be-done that service is fulfilling; 3) Find out what new free app or offering solves this job-to-be done for you, creatively and easily; 4) Observe users of the established service mock, sneer at, and not take the app seriously; since ‘obviously its users don’t understand the finer points and subtleties at play here’. 5) App grows month over month, with virtually none of its growth coming from people who used the original paid service. Here’s an example that my friend Jan and I stumbled across yesterday, for instance: plenty of people pay money to personal trainers and coaches in order to help them meet their fitness goals. Although there might be some technical expertise involved (how to lift properly, for instance), their main job is to keep you motivated and hold you accountable. If you’re serious about getting in shape, then this may well be a good investment for you. But now let’s say your friends discover an app like Gym Shamer, which (entertainingly) tweets out to all of their social media contacts whenever they fail to go to the gym a certain number of times per week. It’s pretty effective, and it’s free. Over the next few months, you find that quite a few of your friends are using Gym Shamer, and they all seem really motivated to keep up with their workout schedule- probably just as much as you, even though you’re still paying that personal trainer to yell at you in person. Your natural reaction will probably be to defend your purchase- “Well, obviously that app is fine for casual gym-samplers like those people, but for power users like me, you need to work with professionals. I have far more serious requirements than those bums do.” as well as to get upset on behalf of your personal trainer that they could possibly be run out of business by such a stupid, gimmicky app. Well, ‘It’s not about you’ certainly applies here. You’re still paying your expensive, ‘incumbent-technology’ personal trainer and enjoying the premium benefits that come with it. But most people don’t need the bells and whistles. They just need something to keep them motivated, and Gym Shamer nails that right on the head. So relax: Gym Shamer was never intended for you anyway. It’s not always all about you. So, to the New York Times faithful, and all of those worried about society’s lowering standards for journalism (whatever it is you think that means): chill. You’re clearly a very sophisticated individual, and your highbrow news won’t go anywhere. And to anyone else worried that some cheap, inferior joke of a new offering (that has become popular really quickly!) somehow threatens your high standards and expectations, you need to realize that this isn’t about you.